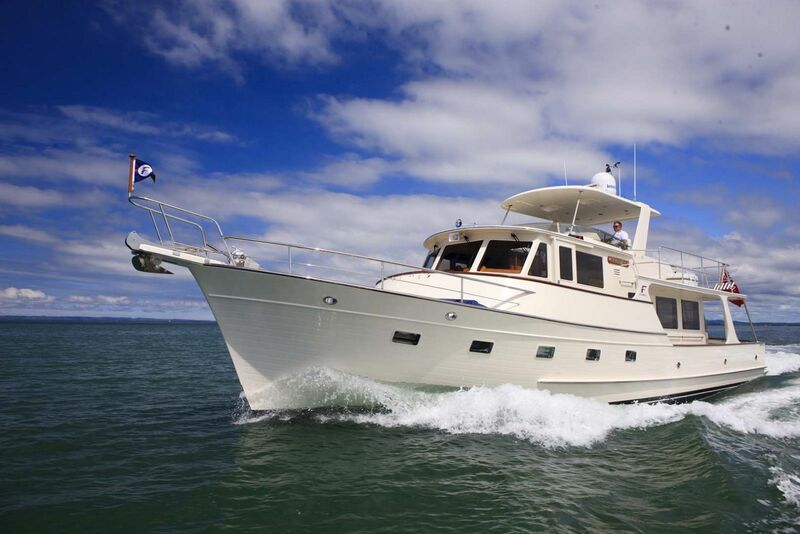 The Fleming 55 is a well-proven raised pilothouse motoryacht designed for serious cruising. 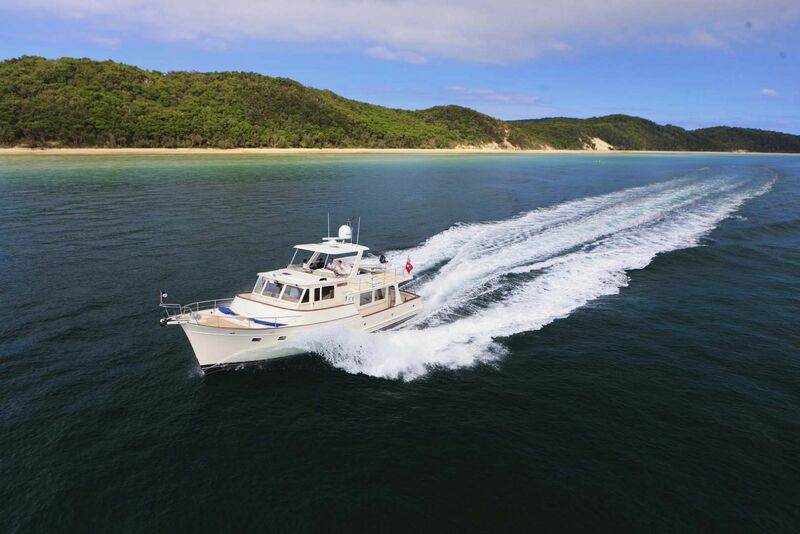 Her semi-displacement hull gives her great flexibility in performance. 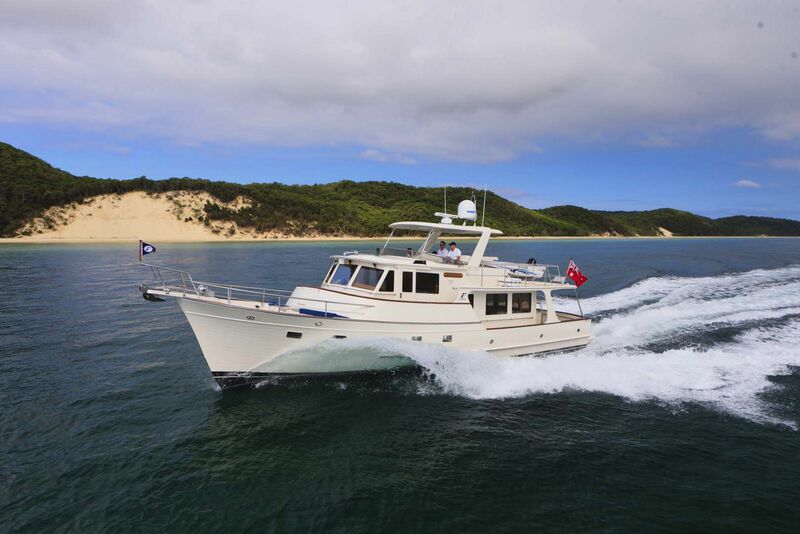 The Fleming 55 has a range of 2,000 nautical miles at 8 knots yet, with her standard Twin Cummins QSC 500 hp common rail engines, she can attain a top speed of approximately 18 knots. 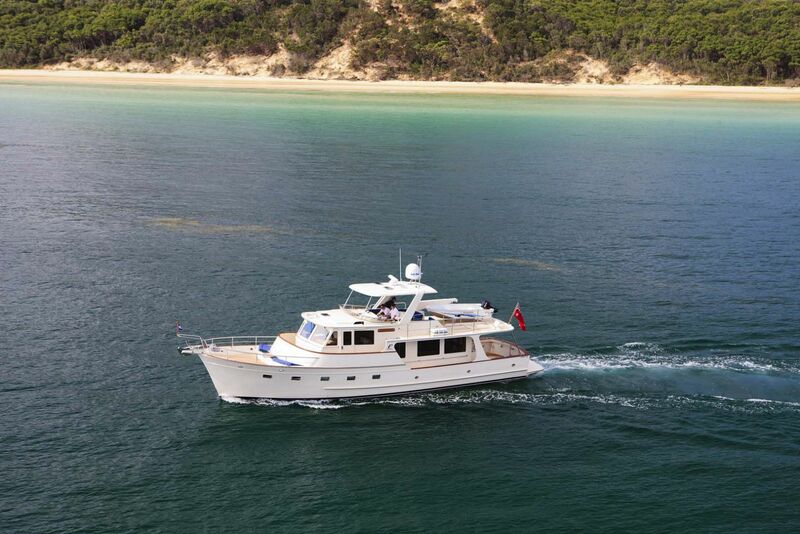 Maximum sustained cruising speed is around 17 knots where her moderate deadrise provides a very comfortable ride. 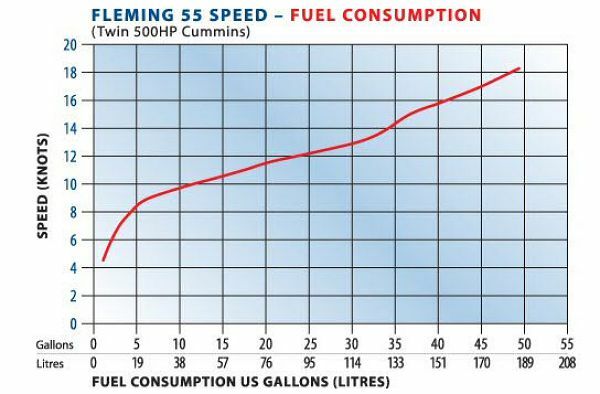 On longer passages, Fleming owners typically cruise at a very economical speed of 10 knots, where the typical fuel burn is slightly more than 10 gph. 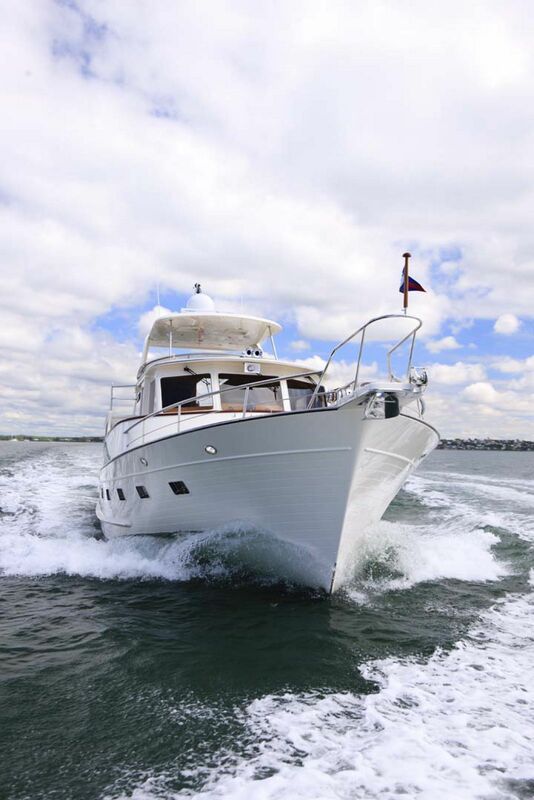 The Fleming's deep keel provides protection for the running gear and stability in following seas. 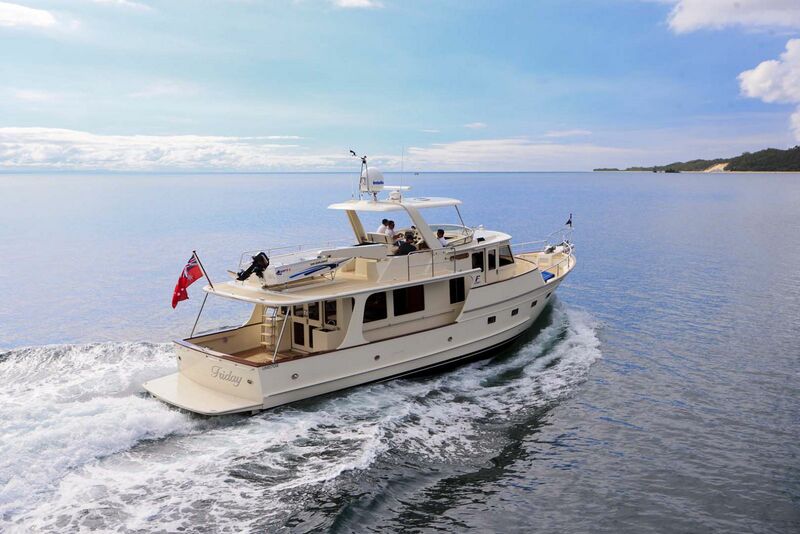 Because noise and vibration contribute to fatigue, Fleming has paid special attention to producing a yacht which has become the standard in the industry for its whisper quiet, ultra smooth ride. Fundamental to this achievement is the use of Aquadrive anti-vibration drive systems. 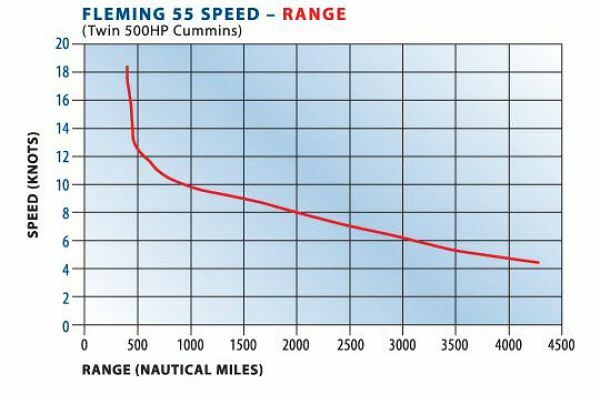 The Fleming 55 was first introduced in 1986, and since that time it has benefited from a rigorous program of evolution. There have been literally hundreds of improvements made, both big and small. 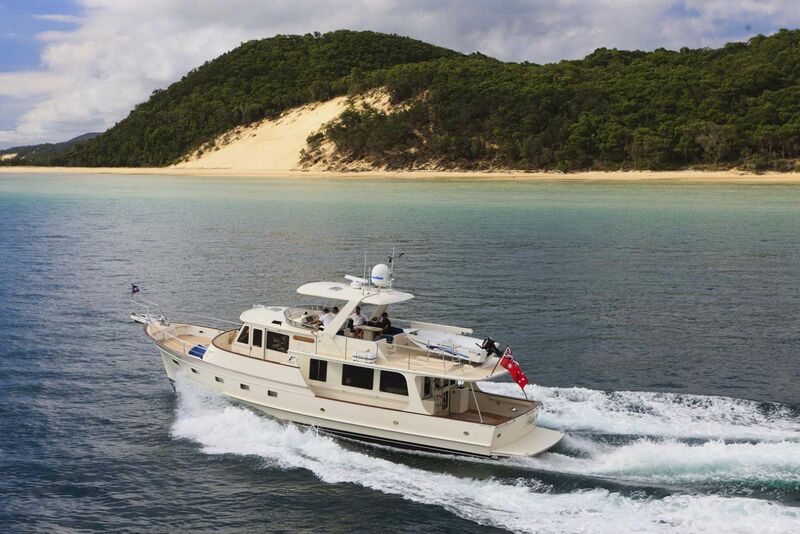 While its legendary hull design remains essentially the same, today's Fleming 55 is a thoroughly modern yacht utilizing advanced technology, materials and construction methods. In 2019 construction of hull number 250 is well underway, making it one of the most successful production yachts in history. 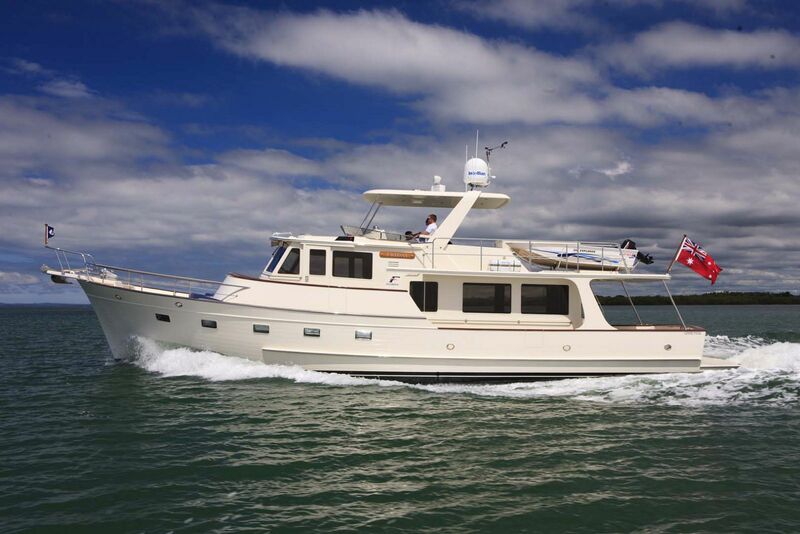 Special attention has been paid to the ability to set and retrieve heavy ground tackle on the Fleming 55. 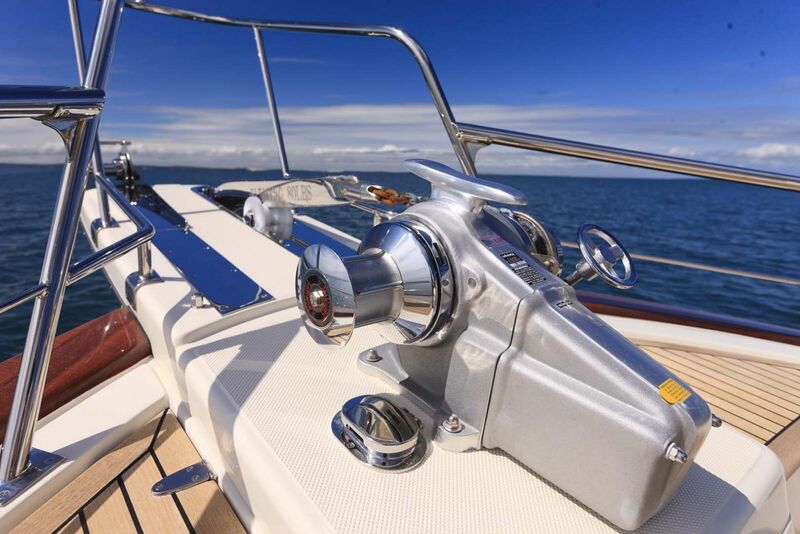 The fiberglass anchor platform is equipped with twin Maxwell RC12 vertical windlasses with capstans for both rope and 3/8" (10mm) Grade-60 stainless steel chain. 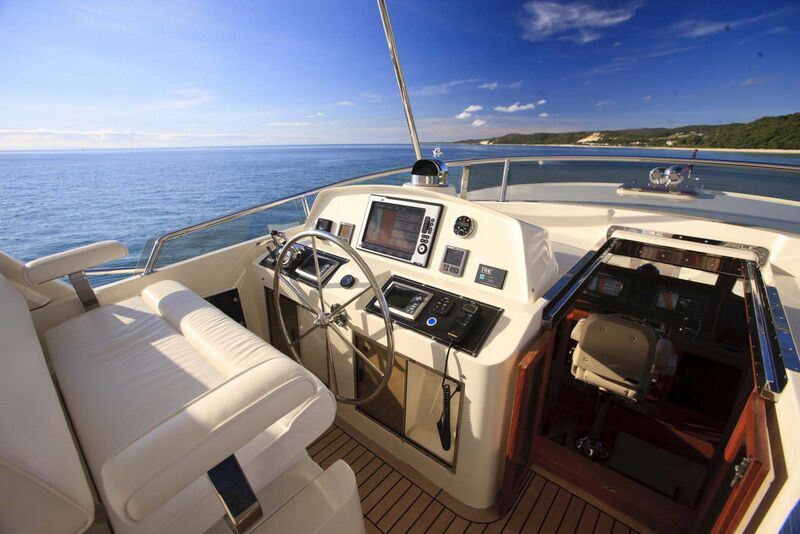 The windlass has a plug-in remote control as well as controls in the pilothouse and on the flybridge. Double sets of grooved rollers make it possible to self-launch and stow two 77 lb (35 Kg) Ultra anchors. 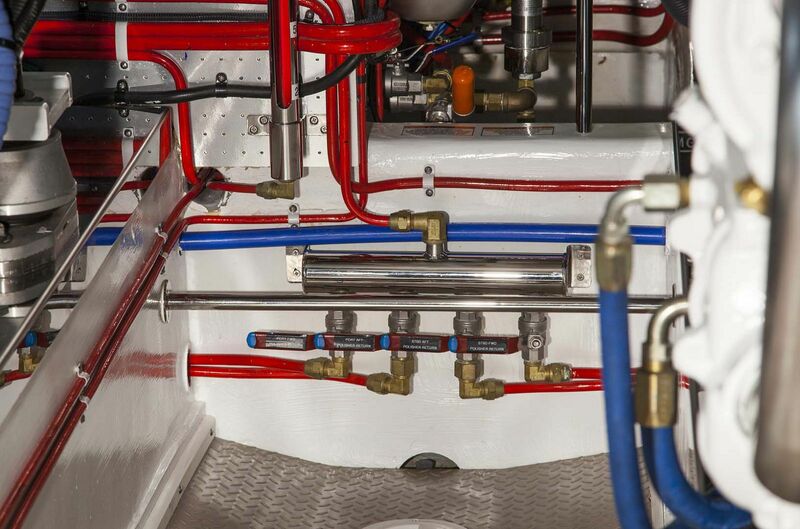 Hose bibs for salt and fresh water are located next to the anchor platform, and there are deck lockers to port and stbd. 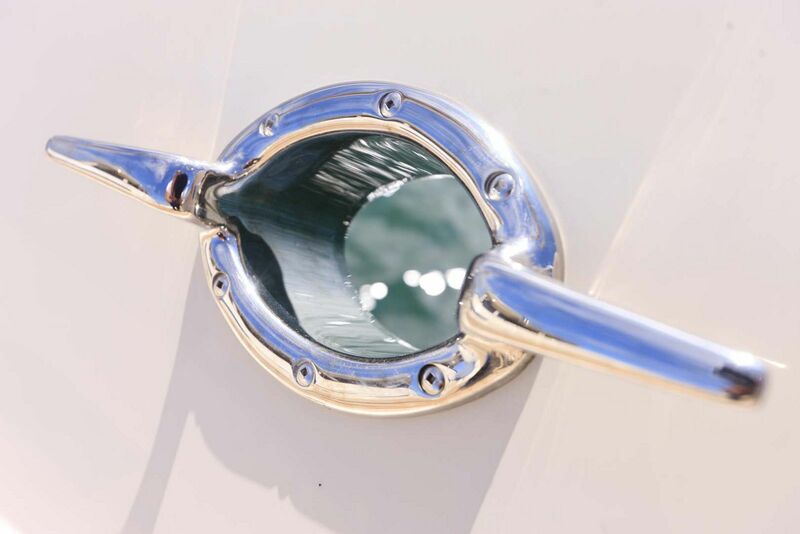 A lock-down hatch on the foredeck provides convenient access to the forepeak, which is separated from the rest of the yacht by a collision bulkhead. It has an area for storage of chain and a separate ventilated rope locker. Each features a bitter end fitting. 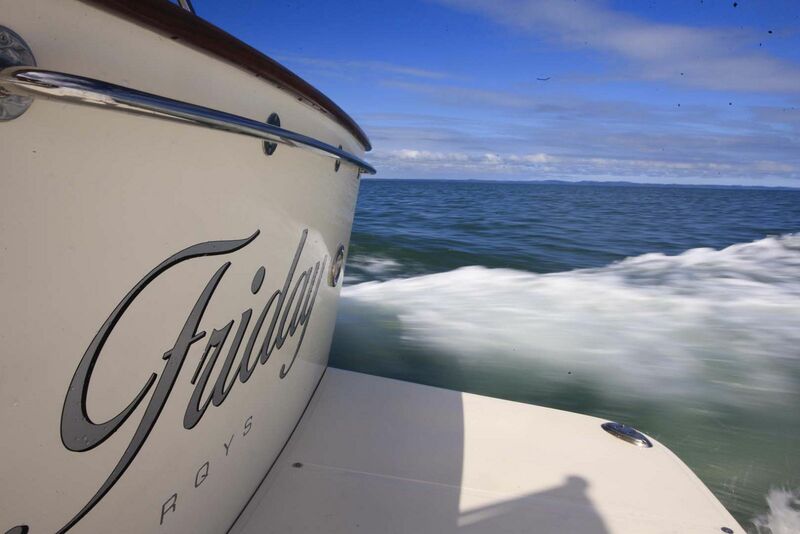 The forepeak drains directly overboard and can be hosed down without concerns that water will contaminate the bilges. 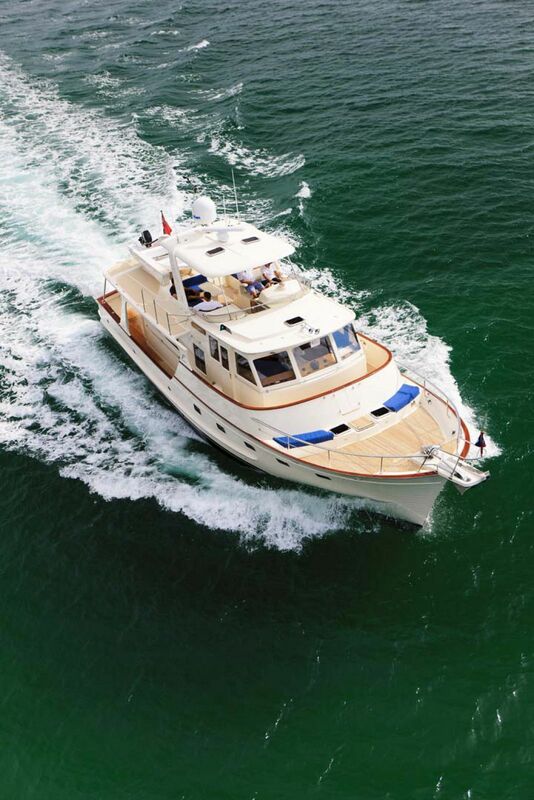 The flared bow turns aside green water and provides a forward deck of unusually generous proportions. The oval stainless steel handrail has been brought inboard of the sloping bulwarks for convenience and security. 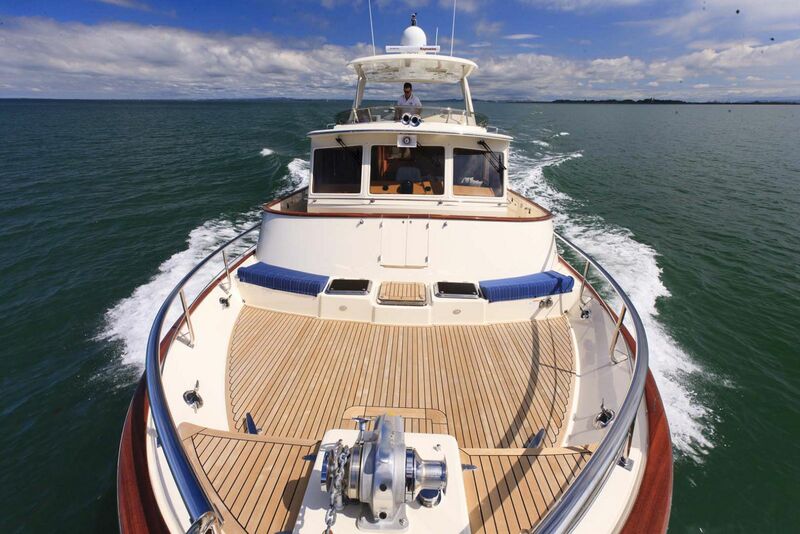 To prevent streaking of the hull, the deck scuppers are piped down to the boot stripe, rather than being allowed to drain directly overboard. Further protection against heavy weather is provided by the design of the Portuguese bridge. 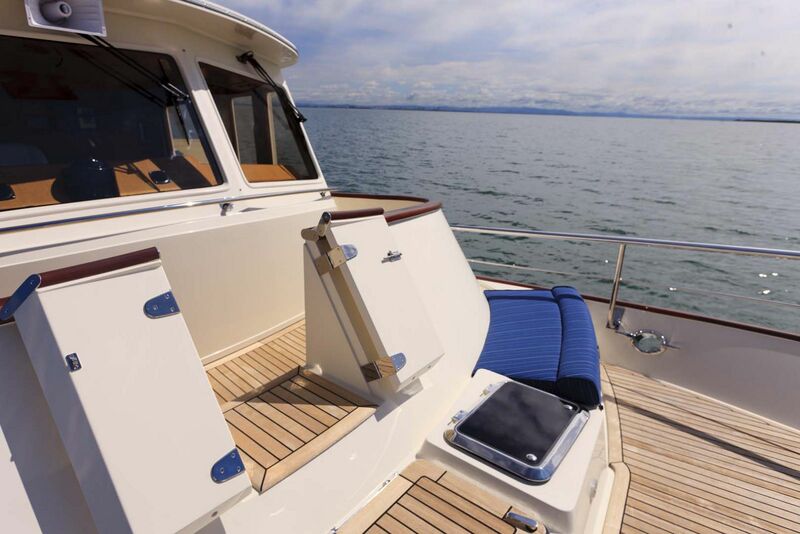 There is comfortable seating on its forward side, which is also the location for the forward shorepower inlet. 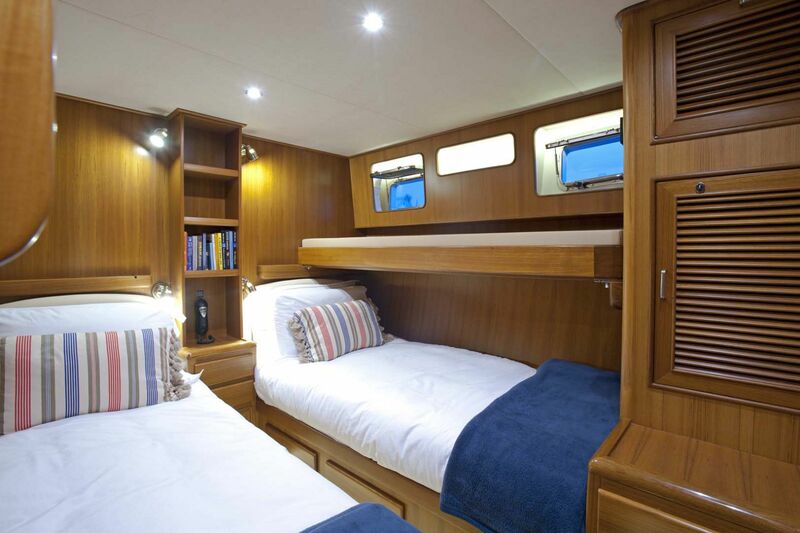 There is ample storage for fenders and lines inside ventilated lockers accessed from the aft side of the Portuguese Bridge, and double doors close off the forward deck areas from the side and bridge decks creating a safe area for small children. 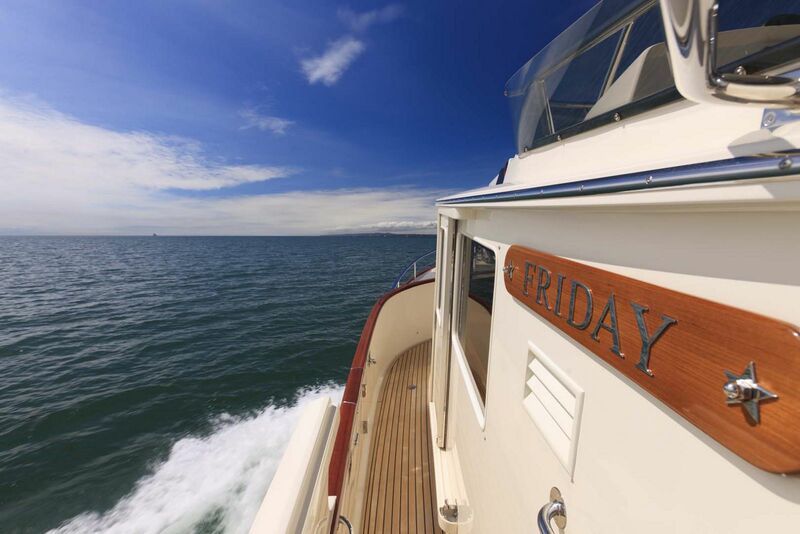 There are sturdy, stainless steel handrails around the forward face of the pilothouse and down both side decks. 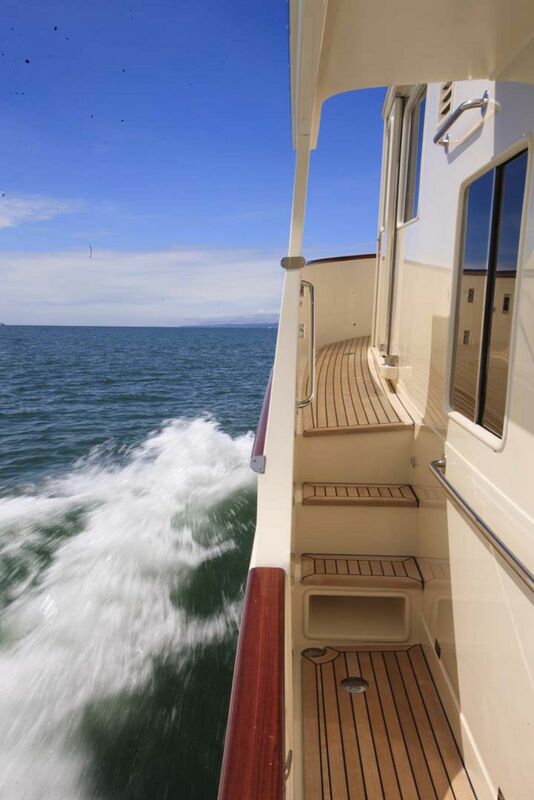 Easy stairs with handrails designed for both adults and children lead down to the wide and well-protected side-decks, which run down both sides of the boat. Here you will find cleats and chocks for forward and aft spring lines. The inward-opening bulwark doors make for easy and safe boarding. 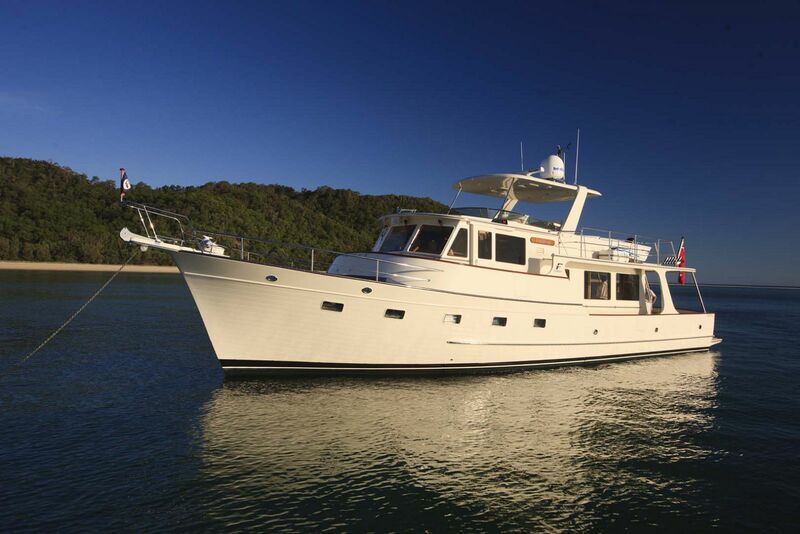 With an area of approximately 250 sq ft. the Fleming 55 aft deck is unusually large. Being all at one level, it becomes an extension of the salon and provides ample space for chairs, donning scuba gear, or fishing. 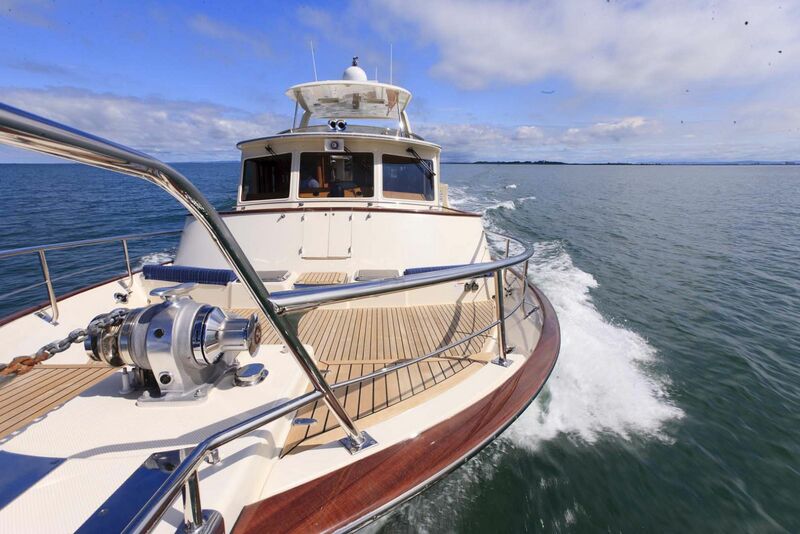 The fiberglass skirt around the edge of the wide teak cap rail conceals mood lighting and hides the engine-room air intakes which are well-protected from salt-laden spray. 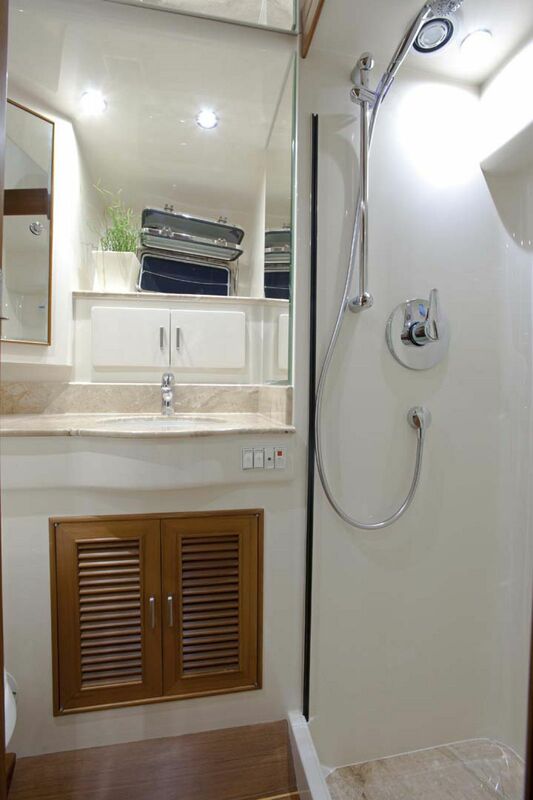 Shower fittings for hot and cold water, located next to the inward-opening transom door, are conveniently placed for use while standing on the swim platform. 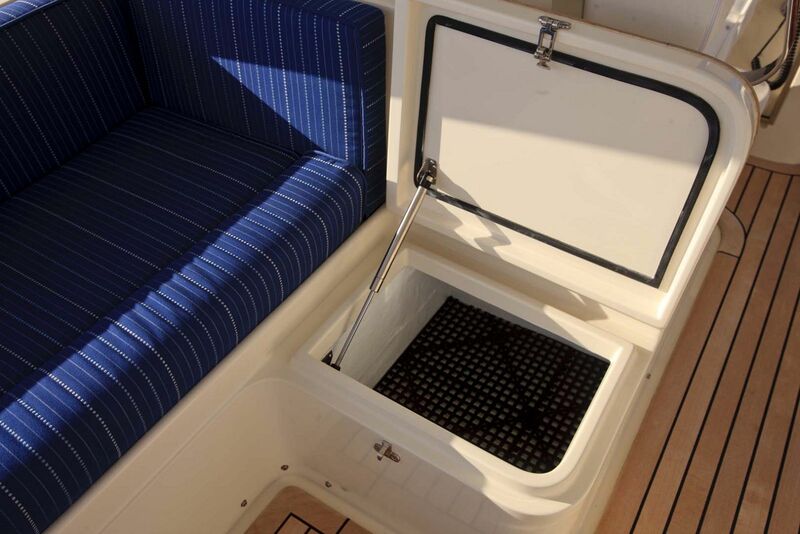 Stainless steel handrails on the transom and a swim ladder, which can be deployed by a person in the water, provide safety and convenience. 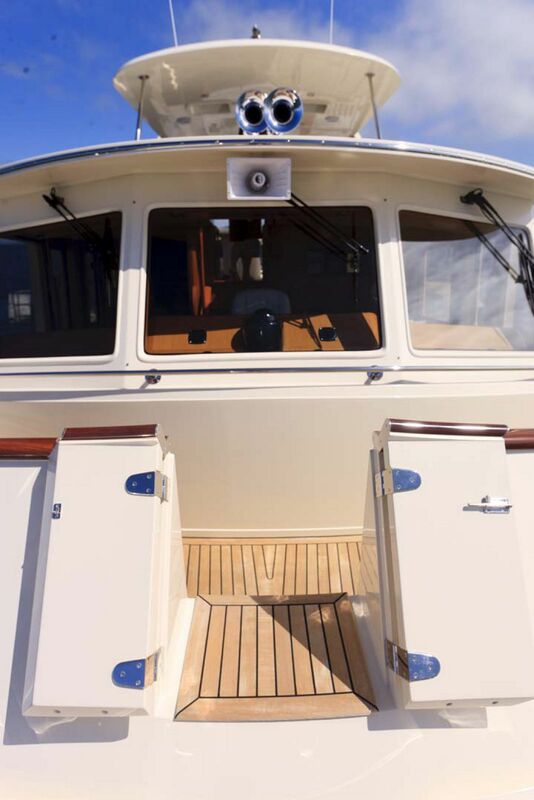 Access to the upper boat deck is via a stainless steel ladder and a sliding hatch in the overhead. 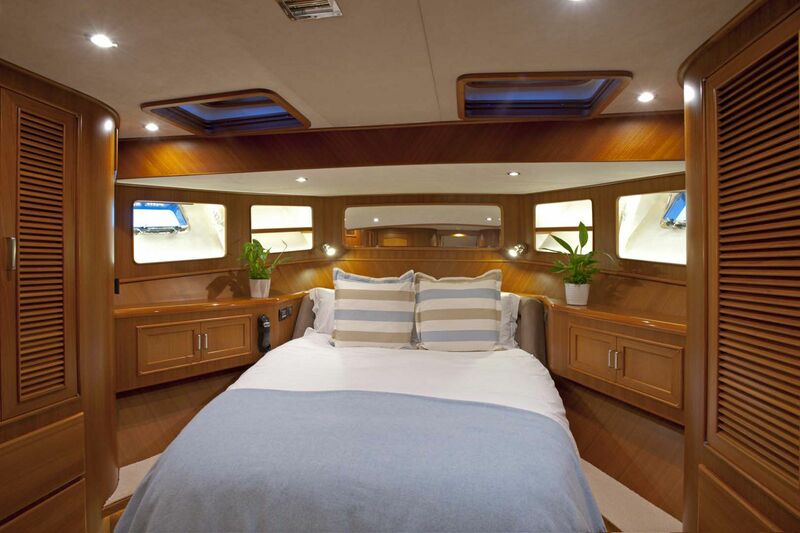 Access into the lazarette is through lockable hatches, with safe and stylish curved corners. Available as options are a console for cockpit engine controls and a locker, which can be equipped with a basin and faucet, insulated chest or icemaker. 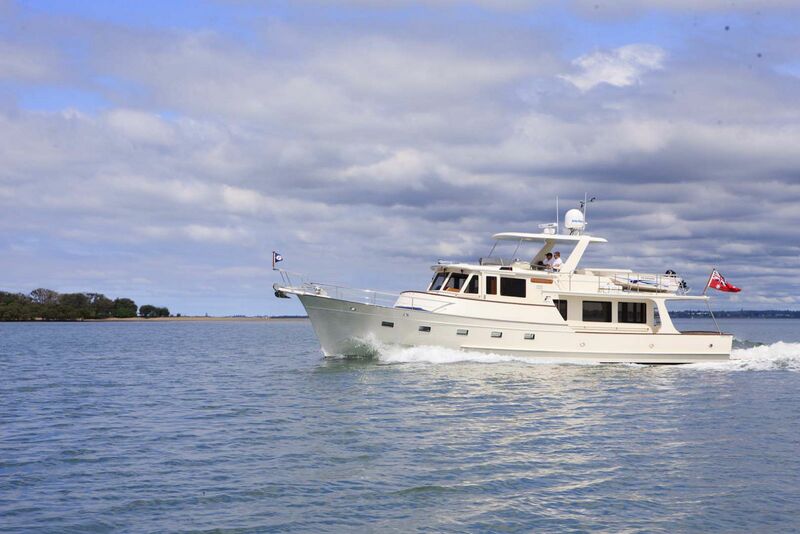 The Fleming 55 low-profile flying bridge is spacious and packed with practical amenities. Its double helmseat, with folding stainless steel footrest, folds forward to access storage beneath it. 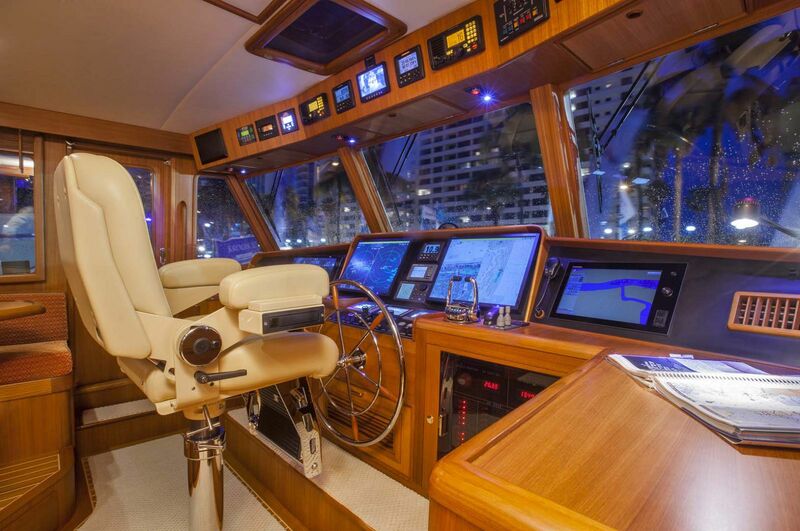 The control console has full engine instrumentation and ample room for electronics. 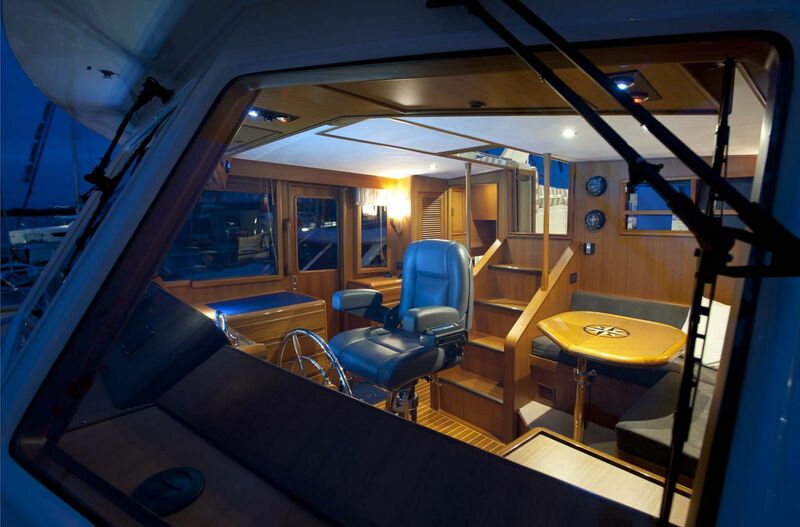 Access to and from the pilothouse is by a protected internal companionway directly from the pilothouse, avoiding the need to navigate perilous steps or ladders where a slip could result in a fall over the side. 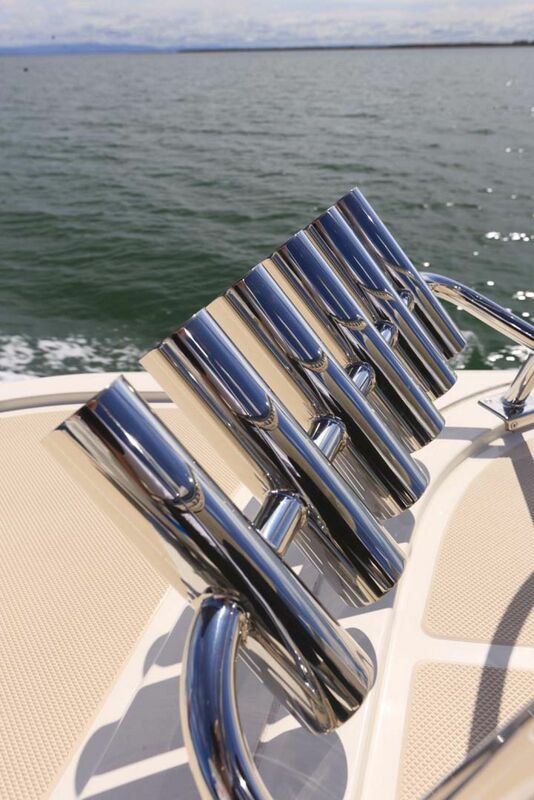 A wrap-around venturi windshield with stainless steel handrail provides protection from wind and weather. 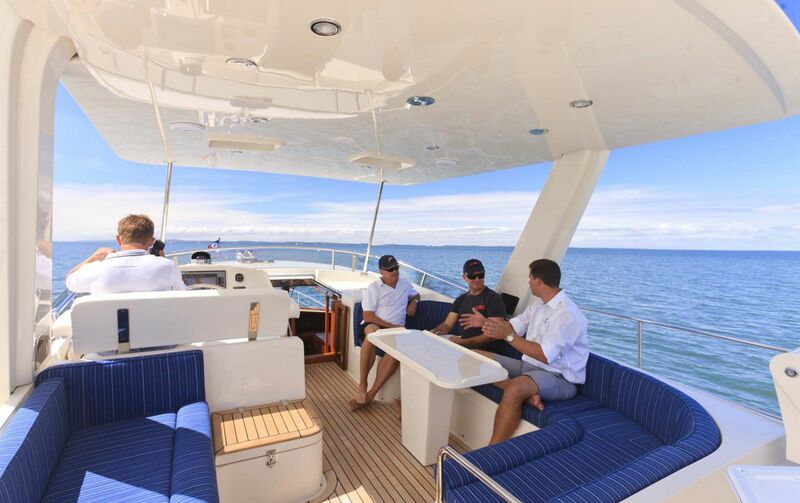 There is seating for eight guests close to, but out of the way of, the helm station. 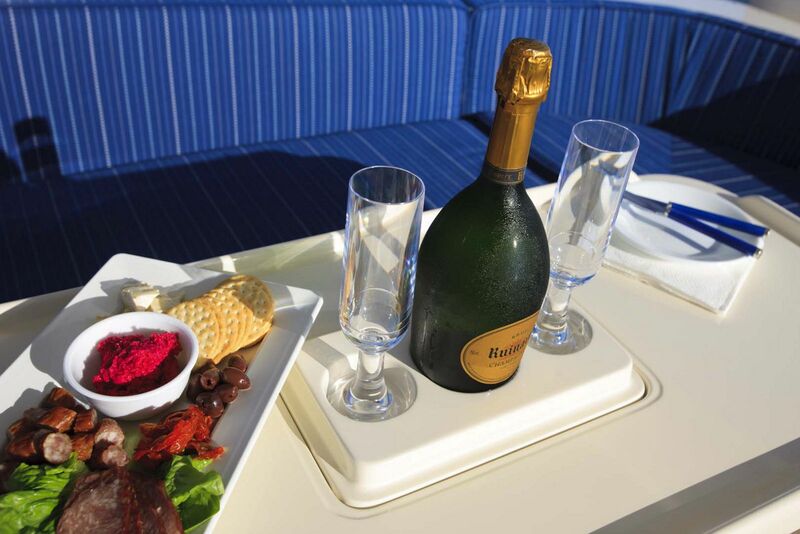 A fiberglass table is standard and an ingenious pass-thru "dumbwaiter" eliminates the need to carry refreshments up from the galley. 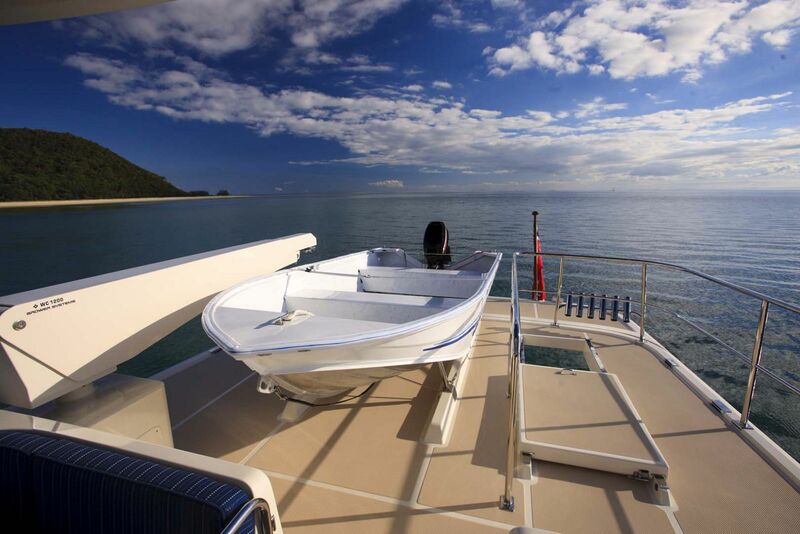 Aft of the seating area is the separate boat deck for the tender and a fully hydraulic davit, with remote control. 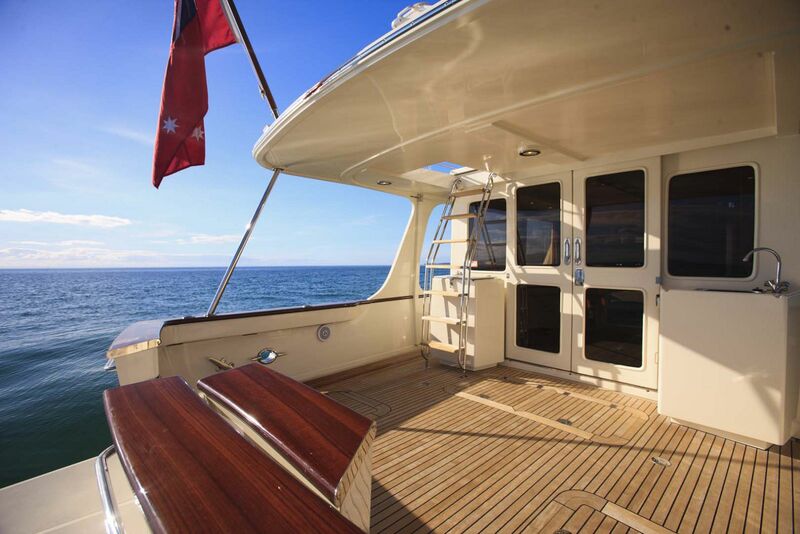 From here, a ladder provides direct access to the lower aft deck. 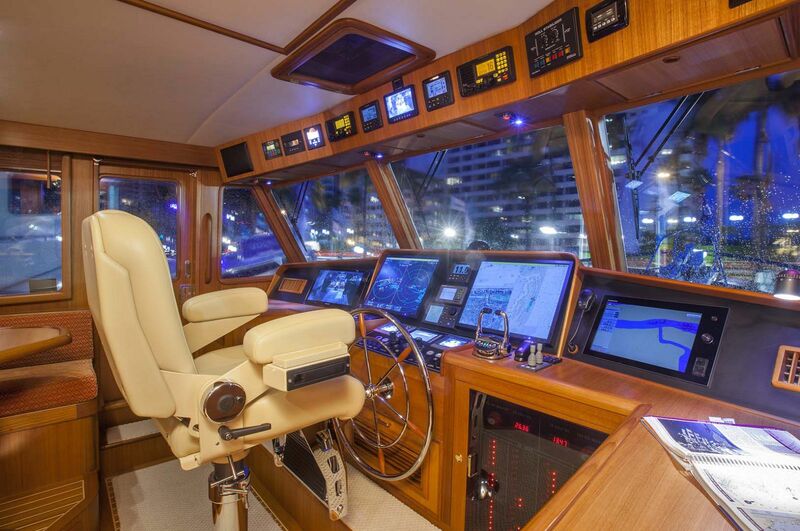 A popular option is the aft facing boat deck control station that provides the captain with excellent visibility aft. 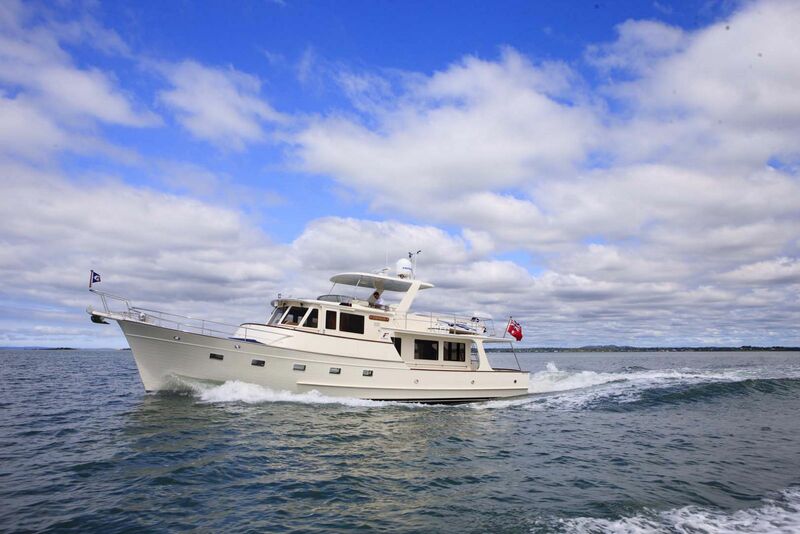 Complete with bow thruster, and engine controls, backing into a tight slip is easier than ever. 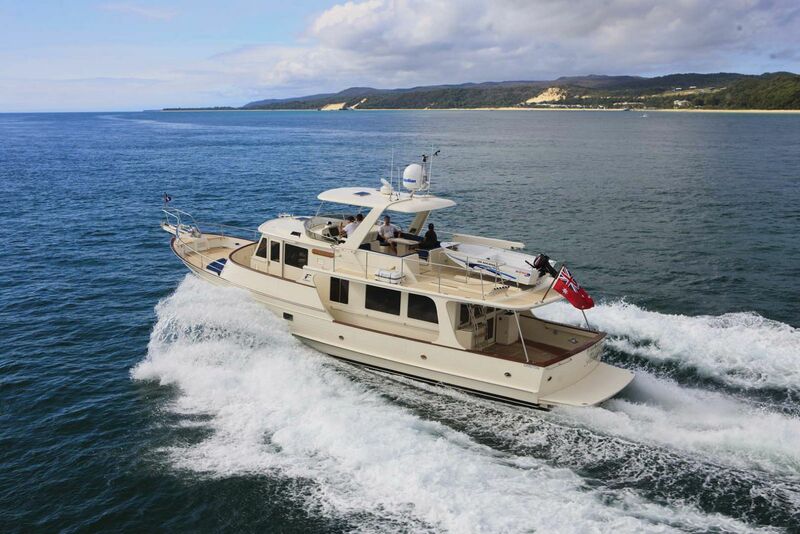 The radar arch provides ample room for the full range of antennae required by modern electronic equipment, and an optional fibreglass hardtop is a popular choice. The salon in the Fleming 55 features a comfortable L-settee with cushions upholstered over wood frames instead of the usual foam cushions on plywood. 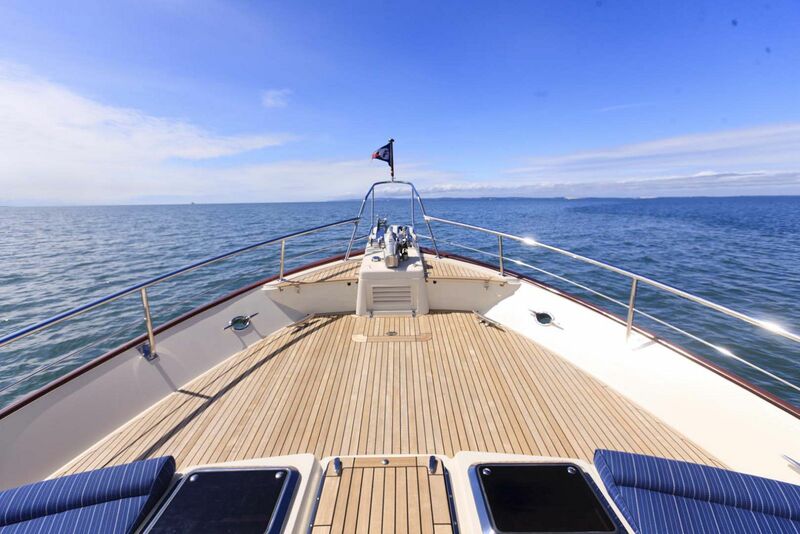 The sole is hand-laid teak and holly strips, and all built-in furniture is of superior quality joinerwork with rounded corners. There is a hi-lo table of unique design making it suitable for dining and as a coffee table. 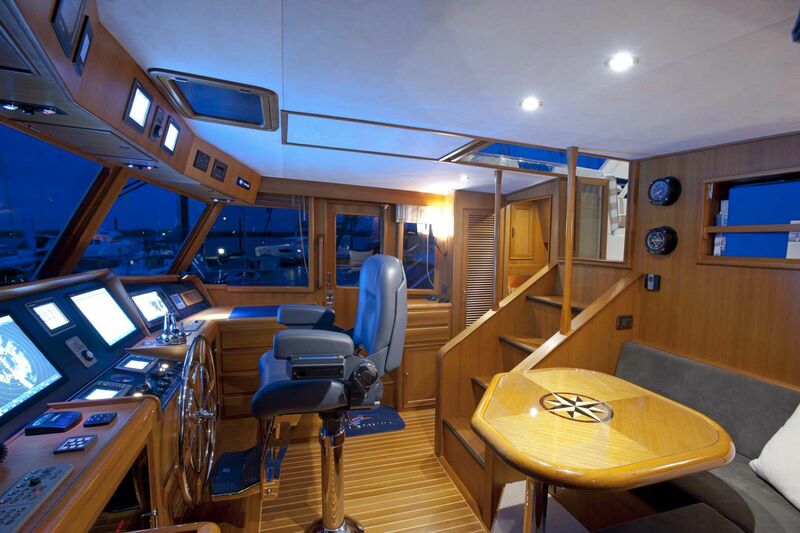 To starboard is a cabinet with powered TV lift and space for entertainment system components. To port is a bar with icemaker. 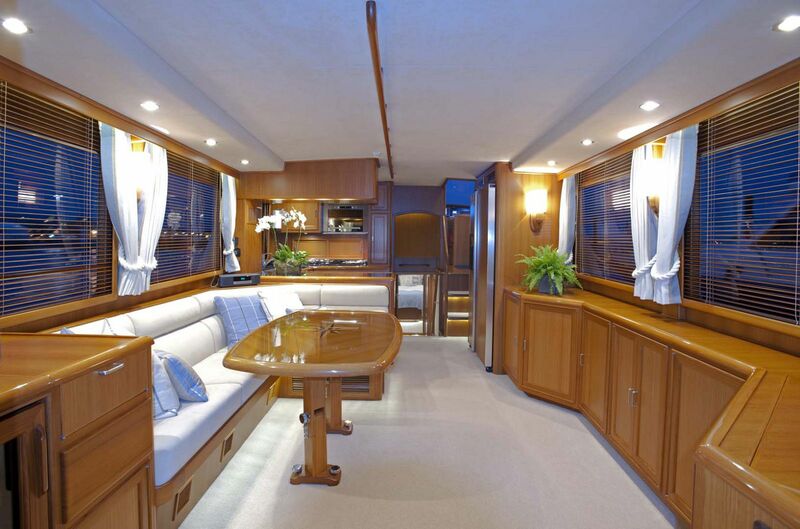 The salon opens directly onto the aft deck through double sliding doors. 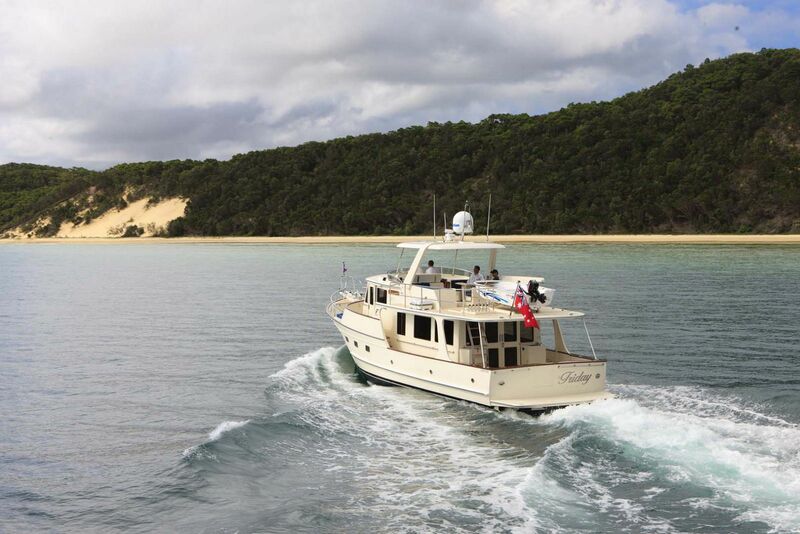 The galley is conveniently located on the same level as the salon and is properly designed to be used while underway. Either Corian or granite counter tops can be ordered. There are ample storage lockers and drawers, and appliances include a 21 cu. ft. side-by-side fridge/freezer with teak-panel doors and chilled water & ice dispenser; Miele induction cooktop with practical custom stainless steel pot-holders; convection microwave; and an undermount double stainless steel sink with waste disposer. Space has been provided for an optional dishwasher. A 20-gallon water heater is conveniently located close to the sinks for instant hot water. 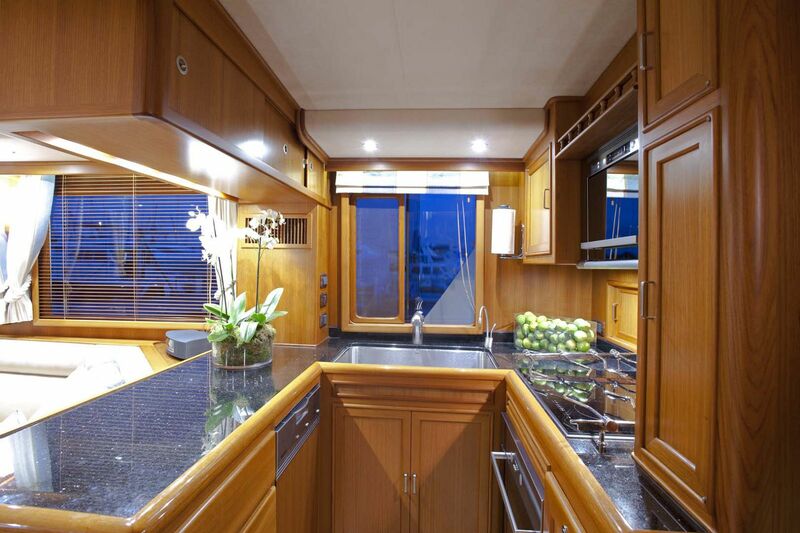 A pass-through dumbwaiter makes it safe and easy to serve food and drinks to guests on the flying bridge. 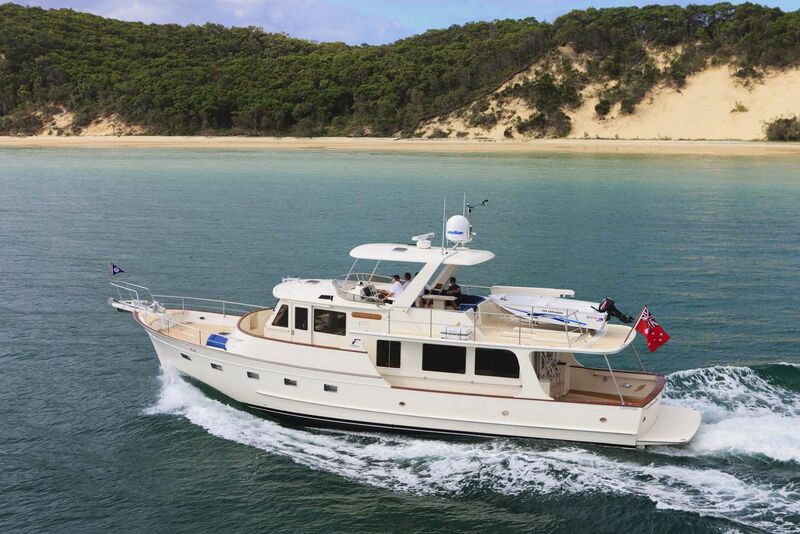 Fleming's signature low-profile design is evident even in the interior, as just a few steps lead up to pilothouse and down to the accommodations. 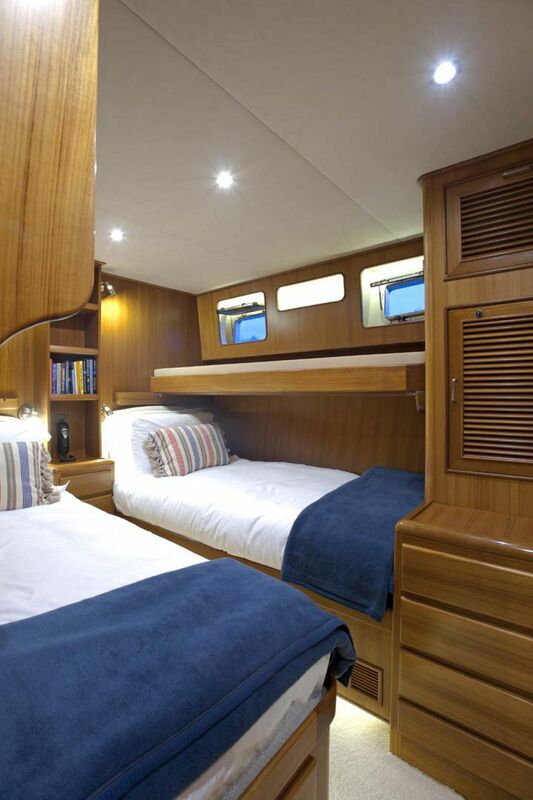 The perfect close to a day of cruising is to retire to a comfortable cabin. The Fleming 55 offers easy access to all the accommodations via a central passageway. A separate washer and drier are conveniently located behind a sliding door in this passage. 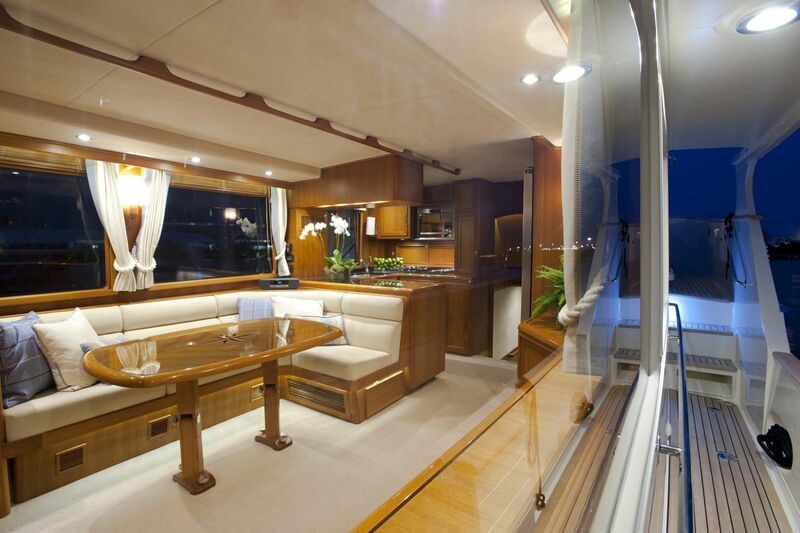 The master cabin is forward for maximum light and ventilation. 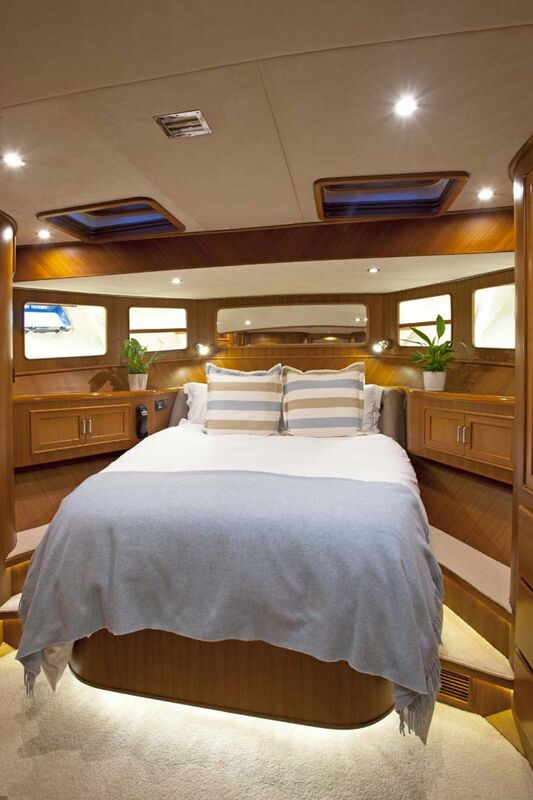 It features a tapered queen berth with headboard. The bed lifts at the press of a button to access storage for bulky items. The bed also slides aft to make it easier to make the bed. There are two hanging lockers with shelves, teak louvered doors and space for a TV. 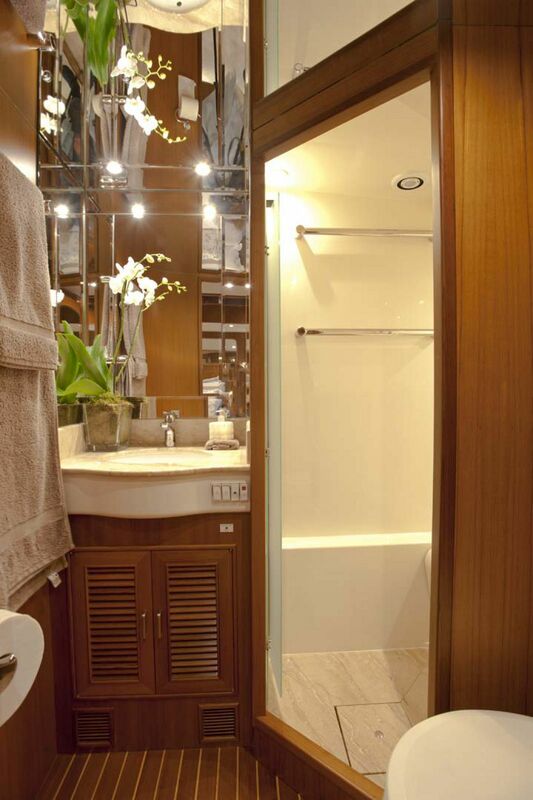 The master cabin has an en suite head with Corian, marble or granite countertops and a molded fiberglass shower stall. Hans-Grohe faucets are used throughout and feature a thermostatically controlled shower. 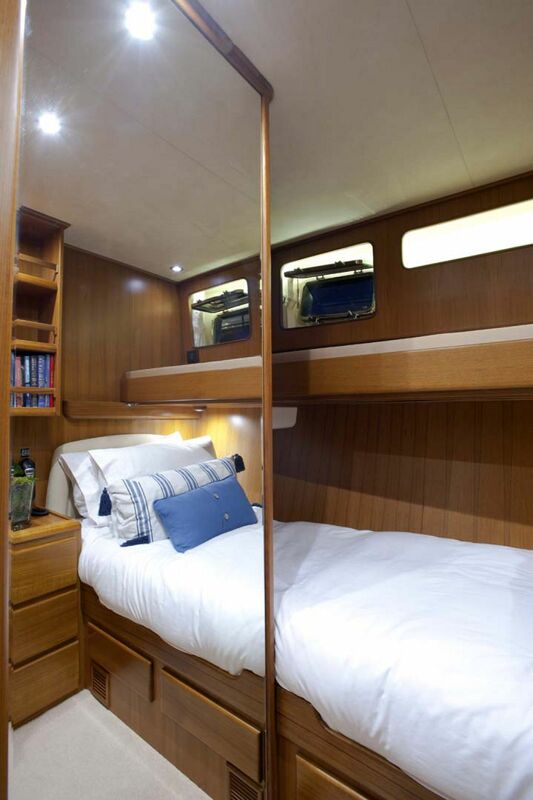 The port guest cabin is offered with either two single or one double bed with headboards. An additional slide-out upper berth with either layout is optional. The aft bulkhead has generous bookshelves. 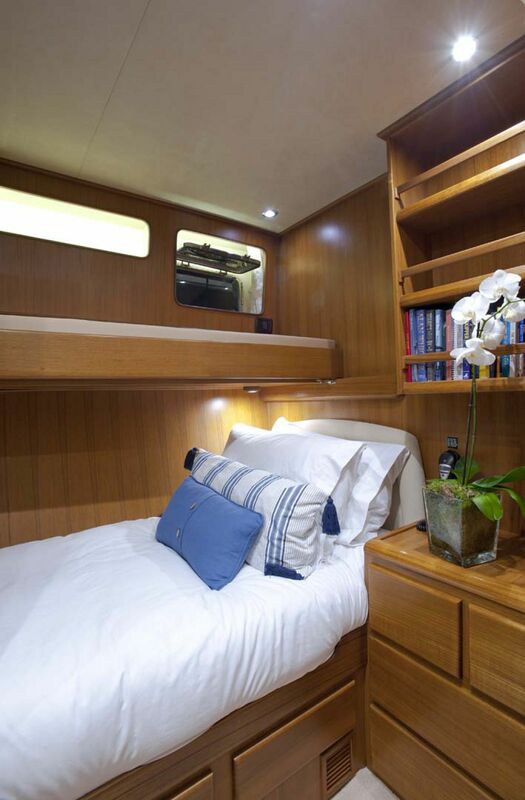 The starboard guest cabin has one lower and one upper, slide-out, upper berth. This cabin can also be offered as an optional office with desk, lockers, bookshelves and space for a computer & printer. The guest head features a one-piece fiberglass molding and shower stall with bi-fold stainless steel doors. The attractive ceramic basin is set in a Corian, marble or granite countertop. Faucets are Hans-Grohe with a thermostatically controlled shower. 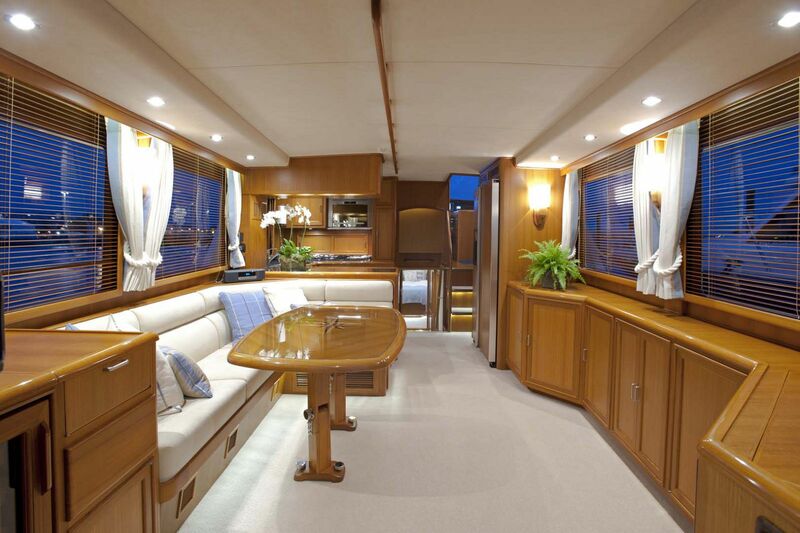 Throughout the yacht all lighting is LED type with polished stainless steel fittings. Teak and holly soles are standard in all interior areas. 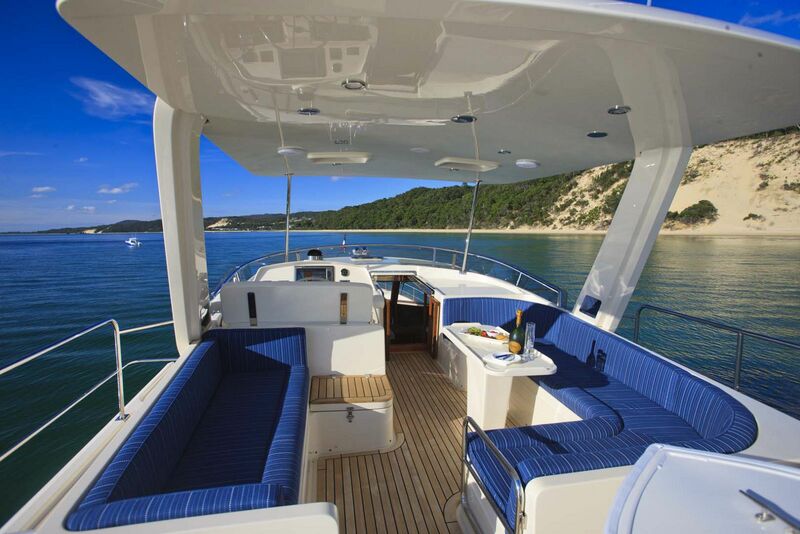 The Fleming 55 engine room is meticulously well thought out and provides easy accessibility to every piece of equipment. 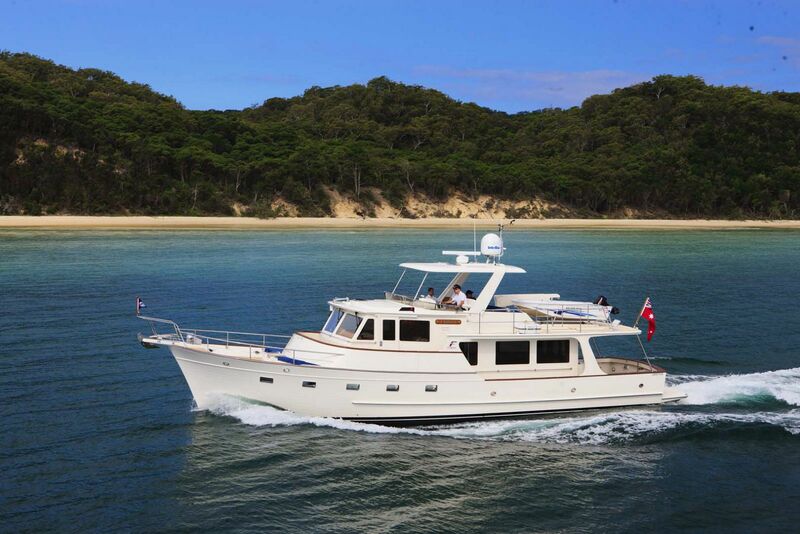 A signature feature of the Fleming 55 is its quietness and freedom from vibration. Much of the credit for this lies with the Aquadrive system, which isolates the engine and transmission from the propeller thrust, permitting the use of much softer engine mounts. 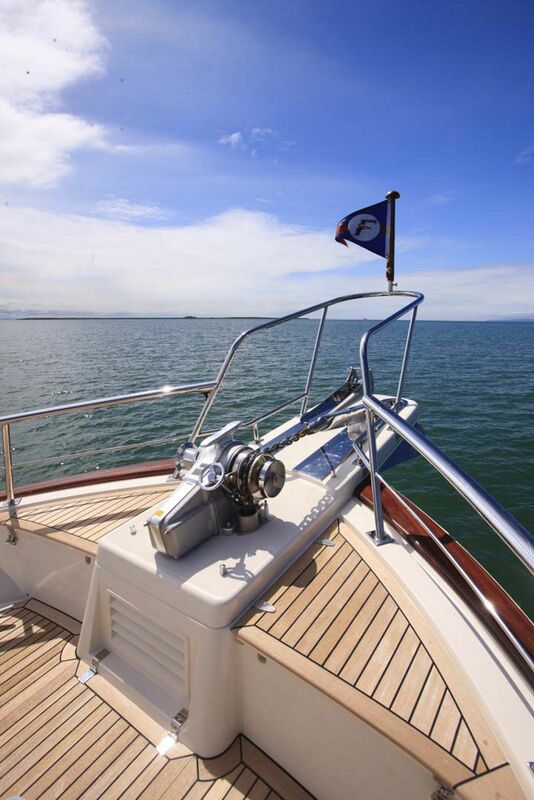 Aquadrive is fitted as standard on every Fleming 55 and their rotating couplings are concealed beneath fiberglass covers for safety. Another reason for the quietness of the Fleming is the careful attention paid to sound insulation. Lead/foam insulation is used extensively throughout and all hatches are dogged down on rubber gaskets. There are even double hatches separated by an air space over each engine. Fuel tanks are made of fiberglass with integrally molded sumps to allow maximum useage of fuel. Vinylester resin is used in their construction on the interior and fire-retardant resin in the outer layers. 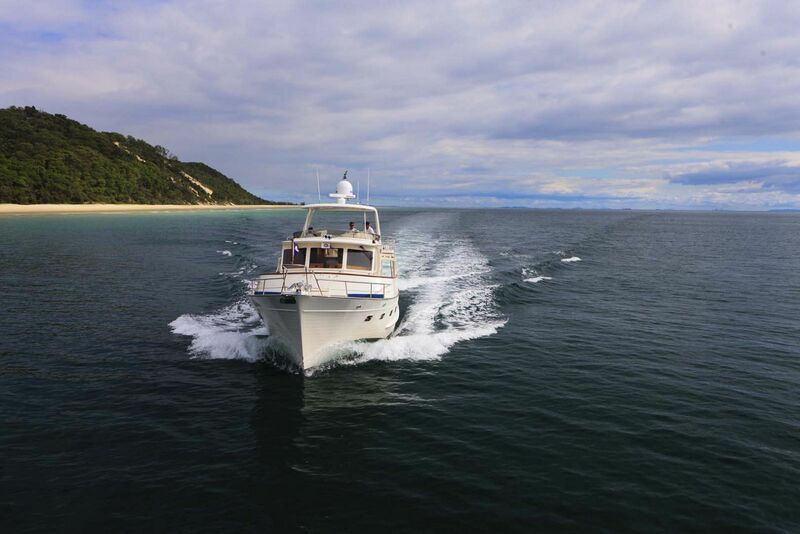 The fuel system has been designed to make the transfer of fuel foolproof. It is impossible to inadvertently overfill one tank by incorrectly switching a fuel return valve. 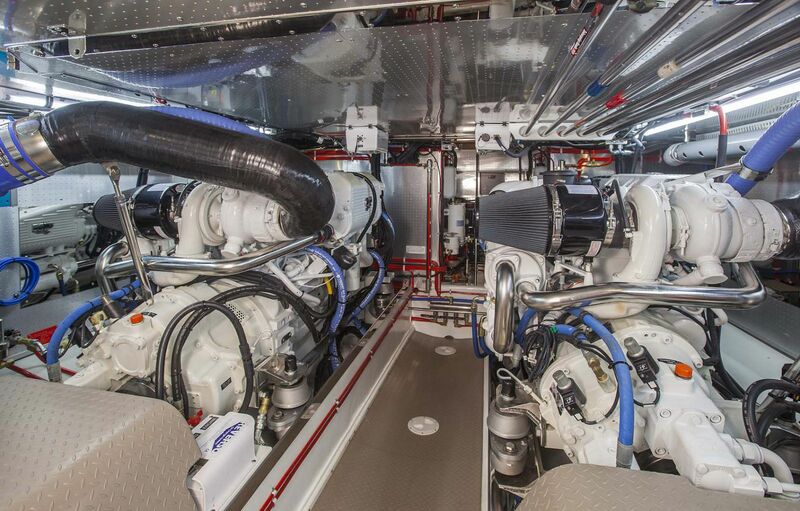 Access to the engine room is via two hatches in the salon sole and from the lazarette through a uniquely shaped oval door designed for easy access. Engine room intake air enters from the lazarette to ensure it is free of salt before reaching the engines and generators. 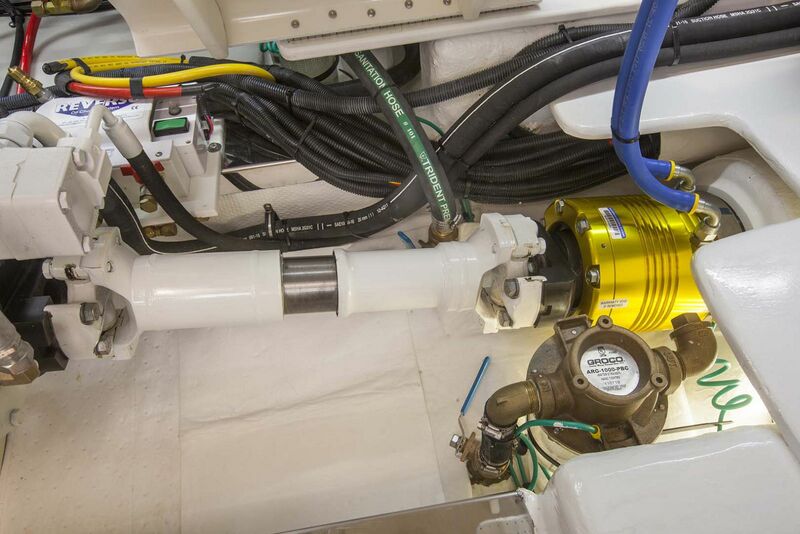 For safety and convenience each Cummins QSC 500HP engine has a start and a stop button located in the engine room, and a PTO (power take-off) on the gearbox provides hydraulic power for the stabilizers which are standard equipment on all Flemings. 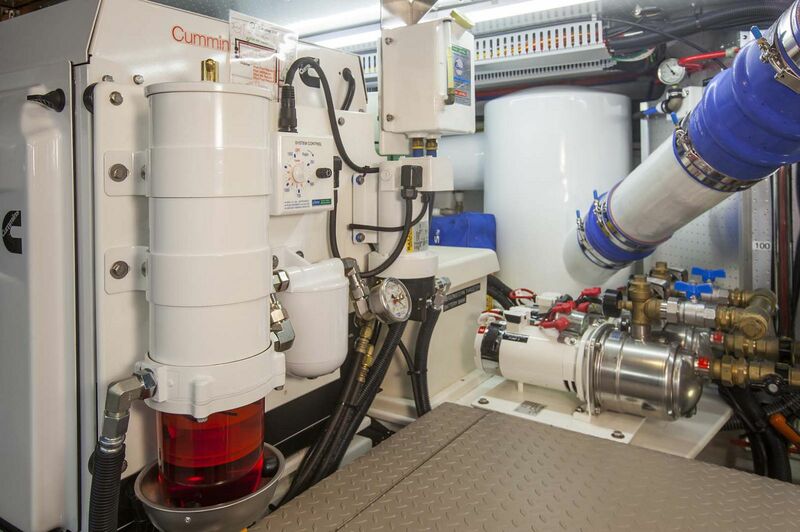 Inside the large lazarette are four polyethylene water tanks totaling 300 gallons (1,135 liters), battery master switches, and a 3,500 watt inverter. 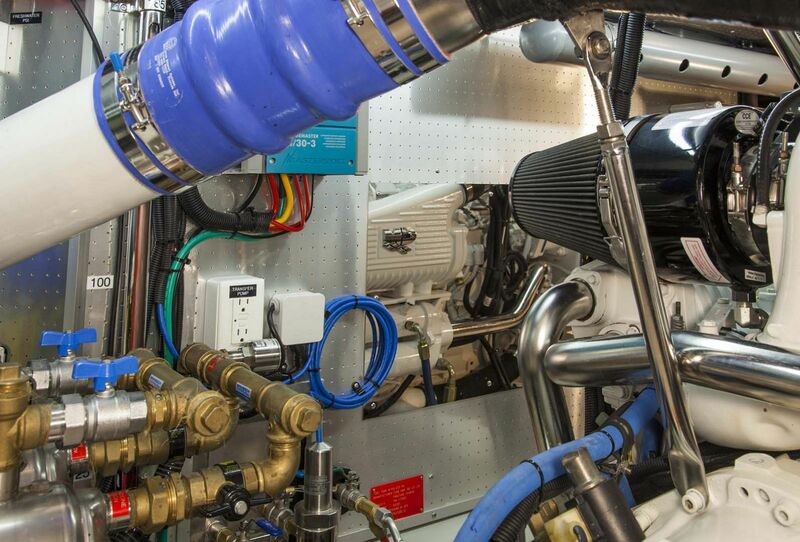 Four air conditioning compressors provide heating and cooling for the entire yacht. 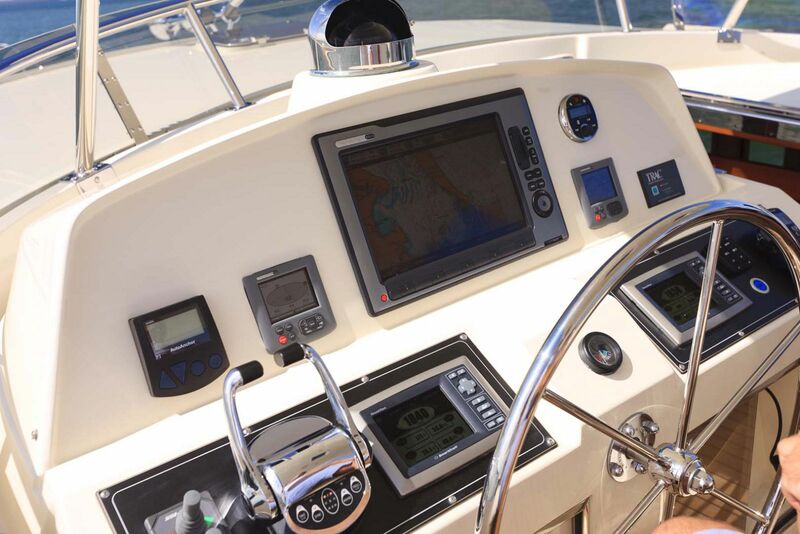 Against the transom is the steering system with its connection point for the autopilot. The tops for the rudder stocks terminate above the waterline. Despite all this equipment there remains 95 cu. ft. of storage for fenders and other cruising gear. Access to the engine room is through the oval-shaped door. 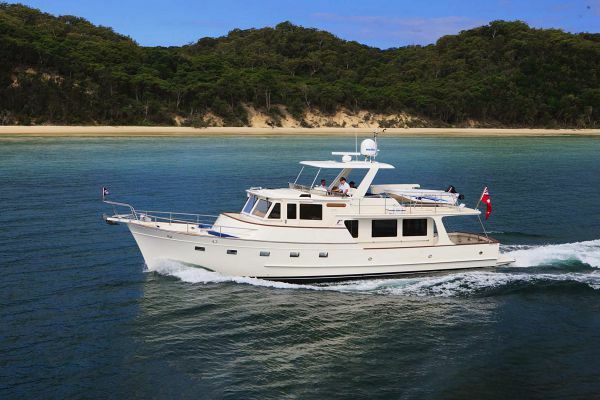 In many modern designs it has become fashionable to eliminate the inside steering station, but the Fleming 55 features a pilothouse which closely resembles the bridge of a much larger vessel. 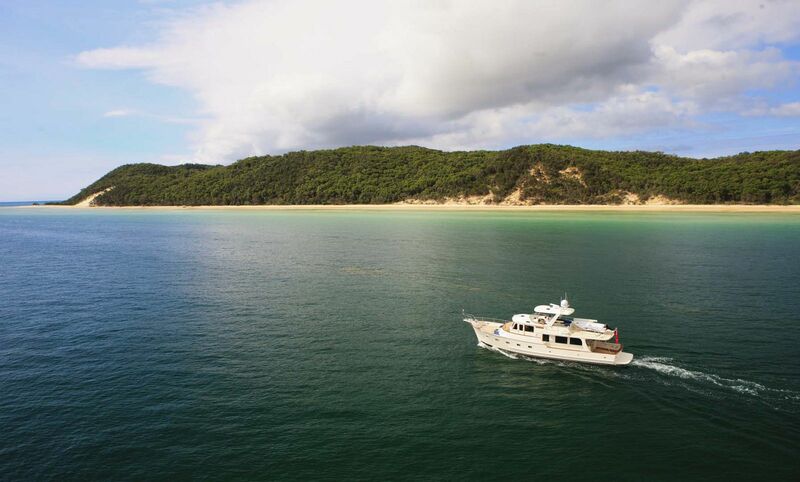 We created a dedicated place from which the boat is piloted and controlled without any distractions from other on-board activities but which is still only three steps from the salon and galley. Four interior steps safely lead to the upper flying bridge station. 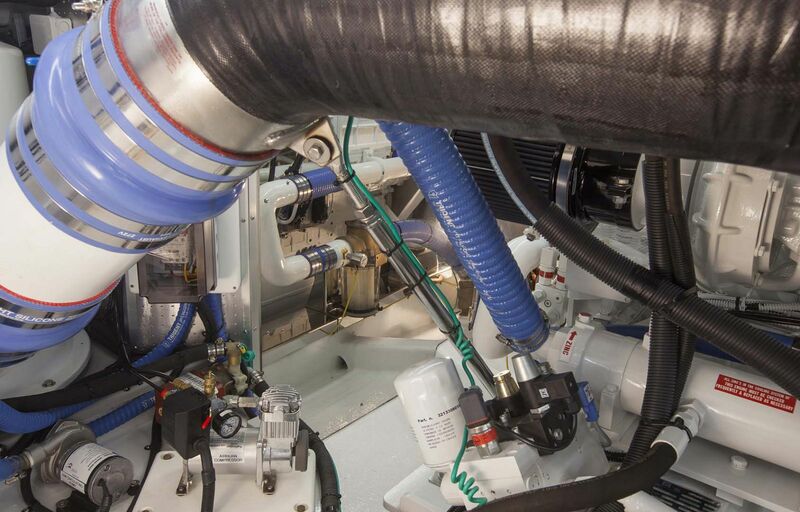 Specially designed removable consoles provide ample room for a full range of modern electronic equipment without intruding on the engine instrumentation. Overhead consoles provide additional space. There is also a proper chart area with drawers and a chart light. 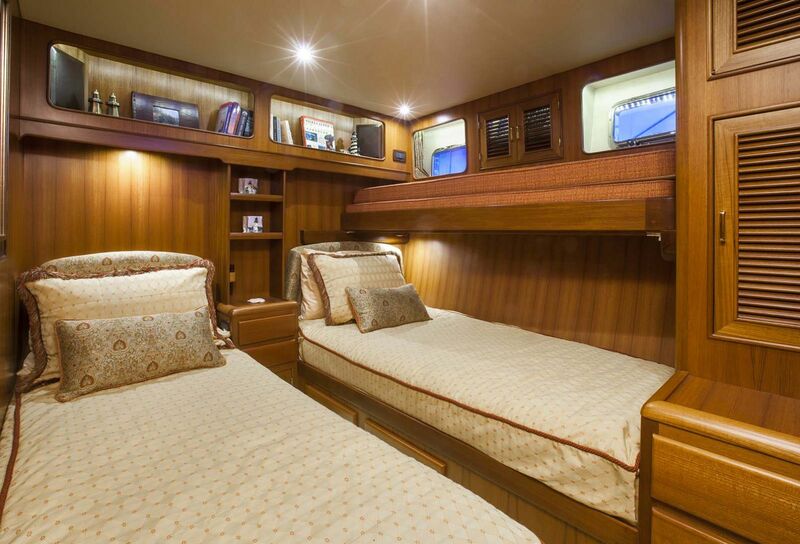 Electrical panels swing out to provide easy access to wiring connections and the inside of the flying bridge console is accessed through a swing-out bookcase. 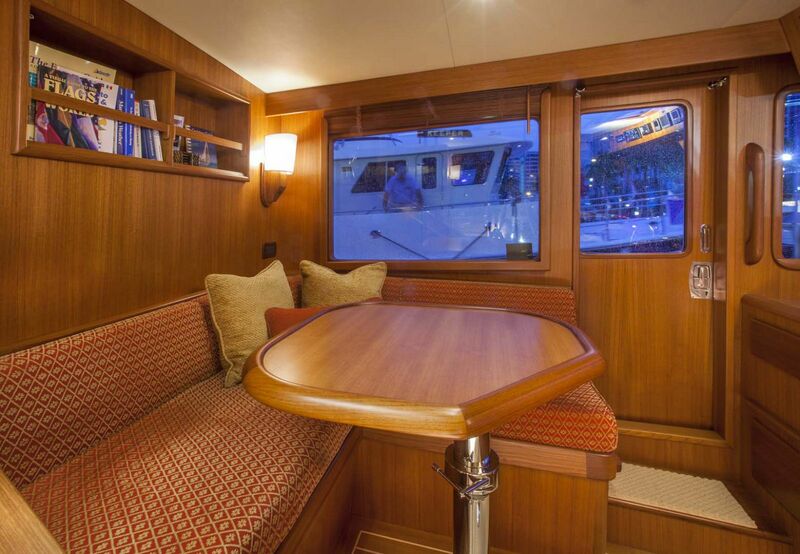 The watch-keeper has their own Stidd helm seat and an adjacent, raised L-shaped settee and table provide a comfortable social area with excellent visibility through the side and forward windows. 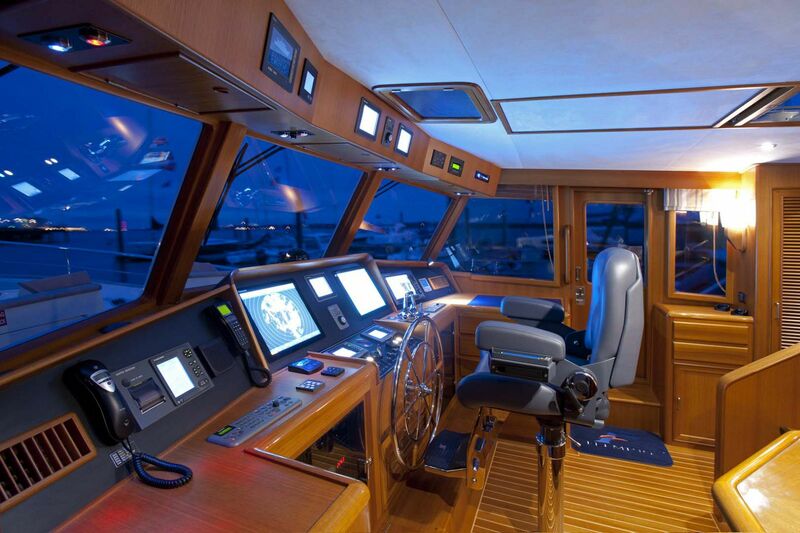 This is truly the nerve center of the boat where all the systems and crew come together in complete harmony. USA - NMMA Certified Manufacturer fully complying with: ABYC, USCG and EPA regulations. 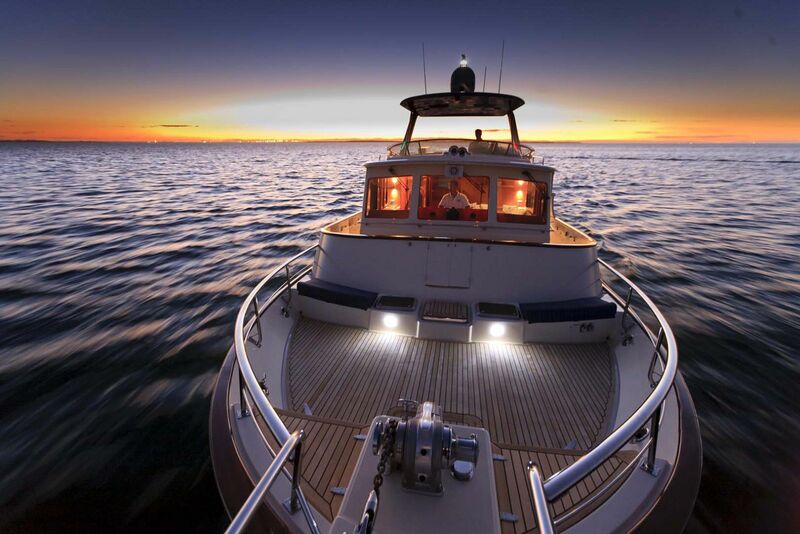 European - Built to CE-RCD Category "A" Ocean Standard using the relevant ISO standards. 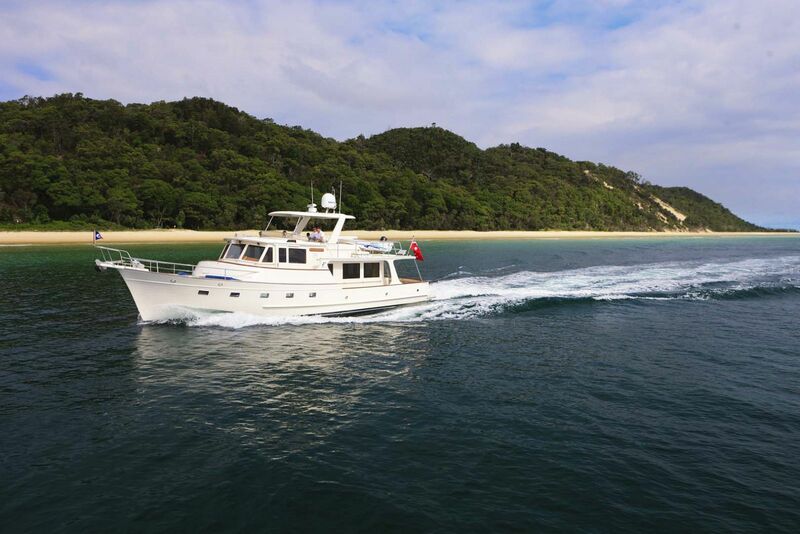 Fleming Yachts Construction (HK) Ltd management and environmental systems have met and been approved by ISO 9001:2008 Quality Management Systems and ISO 14001:2004 Environmental Management Standards. 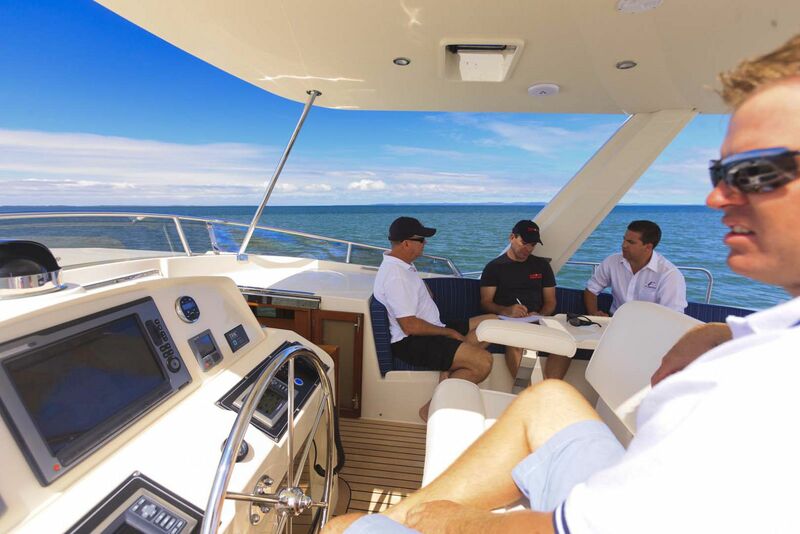 The question most manufacturers ask themselves when considering a new feature is whether it is necessary to include it in order to sell the boat. 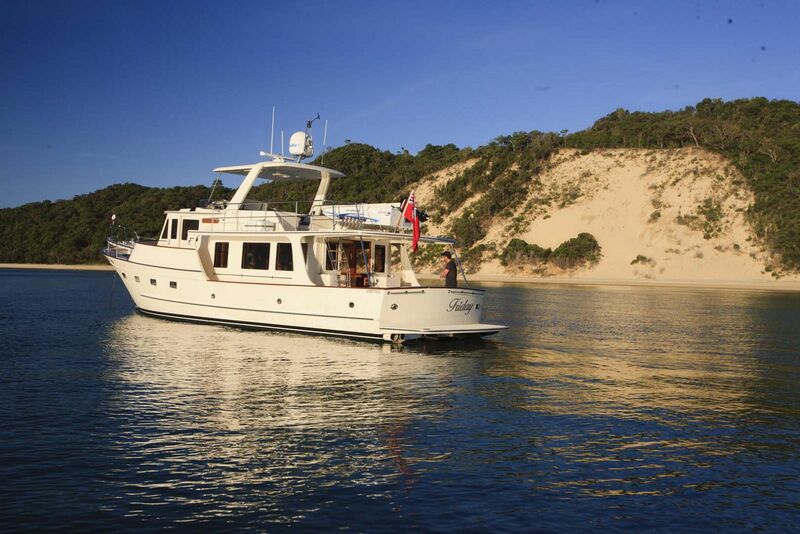 In the case of the Fleming, we ask only whether its inclusion will make the boat safer, better or more convenient. That is why we have introduced literally hundreds of refinements since we started construction in 1985 and why we continue the process today. For that reason, Fleming Yachts reserves the right to make changes to specifications and equipment without notice.